Jake Gyllenhaal has hit a hot streak. Coming fresh off a “renaissance” period of high-profile roles (Prisoners, Enemy, End of Watch, and Source Code), Gyllenhaal plays our leading man in Nightcrawler, Lou Bloom, an unemployed LA native looking for his next gig. Circumstances allow him to become a self-employed photojournalist, capturing horrific and often gruesome incidents on video which he then sells to the highest-paying news station. 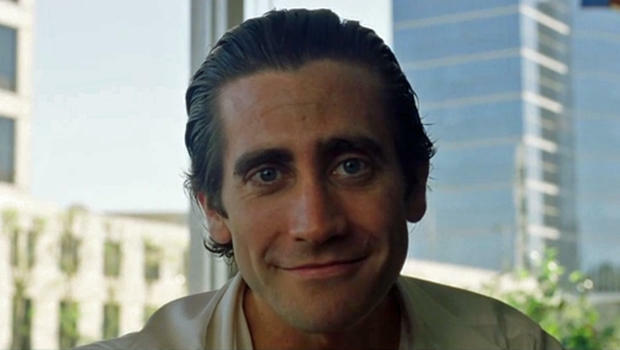 Like its title would suggest, Nightcrawler is a dark, slimy film that brings out the best acting work from Gyllenhaal. His performance as a self-motivated entrepreneur is no doubt the film’s highlight, though the story also provides some pretty fascinating commentary on the seedy activity of modern city life. The script is mostly dialogue-driven, and director Dan Gilroy keeps the few action scenes tight and suspenseful. Darkly-lit cityscapes and warbling guitars add to the film’s pervasive atmosphere and create a drab background for our characters to fill. Supporting Gyllenhaal are Riz Ahmed as Lou’s assistant Rick, and Rene Russo in an excellent role as Nina, the egotistic head of a local news station. Despite the great performances, the script does feel a bit chunky at times; exchanges about the narcissistic nature of capitalism start to lose their edge about halfway through. The prevailing themes about power-hungry corporate culture become less subtle and more satiric as the film progresses. Thematic elements aside, Nightcrawler moves at a fast and fluid pace. Audiences barely have time in between sequences of brutal news footage and car chases to comprehend the full weight of Lou’s gutsy (and often unethical) actions. The film has it’s moments of dark humor too, most often with the contrast of charismatic Lou and his passive sidekick Rick. A scene where Rick tries Lou’s negotiating tactics against him is particularly brilliant. Visually, the film looks incredible; gorgeous shots of nighttime city streets give the film a slick, noir feel reminiscent of Nicholas Winding Refn’s Drive. It becomes clear by the end of the film however, that even the most glitzed and stylish among us have a dark underbelly waiting to be explored. Or Exploited.